****No Upper Chain***** A truly unique extended, 4 bedroom linked semi detached property in the village of Akeley. This wonderful property has been extended and refurbished to a high standard throughout with an open plan living/kitchen/dining space with tri fold doors onto the patio and rear garden. The accommodation over three floors comprises: Reception hallway, ground floor cloakroom, open plan living/kitchen/dining room with engineered oak flooring throughout with under floor heating, a range of integrated appliances to the kitchen, on the first floor: guest bedroom with built in wardrobes and en-suite shower room, two further bedrooms, re-fitted family bathroom to include a double end bathtub plus walk in shower, the top floor accommodates the open plan master bedroom with walk in wet room, wash hand basin housed in granite work top and separate W/C. The interior doors are Oak, Oak engineered wood flooring to the ground floor with under floor heating and under floor heating to bathrooms and Upvc double glazing throughout. An internal viewing is strongly recommended. EPC rating E.
Engineered Oak flooring, stairs rising to first floor, inset down lighters, Upvc double glazed window to side aspect. Engineered wood flooring, low level w.c, concealed cistern, wall mounted wash hand basin with waterfall taps, half height ceramic tiling to walls, inset down lighters, extractor fan, Upvc double glazed window to front aspect. 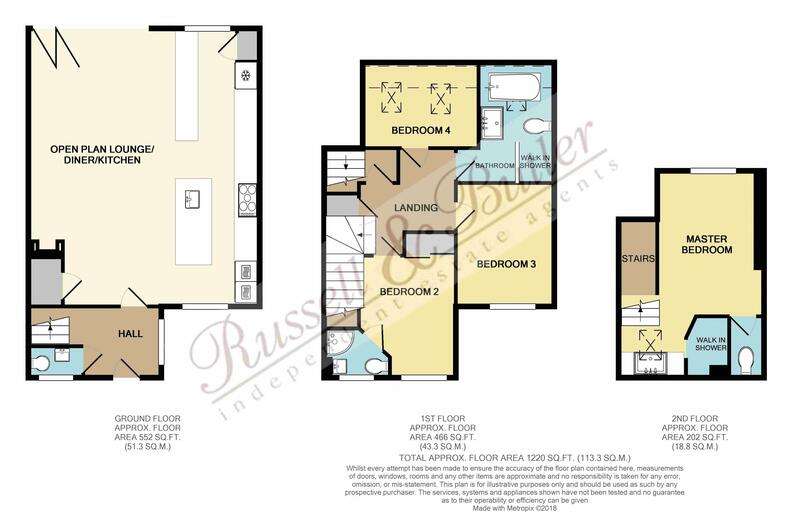 Engineered wood flooring, built in bar area with ceramic tiling to splash areas, built in glass storage space, space for wine fridge, under stairs storage cupboard, inset down lighters, contemporary style radiator, Upvc double glazed Tri-fold doors to patio and rear garden. Refitted to a high specification to comprise; inset sink unit with contemporary style mixer tap, a range of wall, base, eye level and draw units with oak work tops over, discreet under counter lighting, breakfast bar, built in twin 'Neff' ovens, 'Neff' ceramic hob with extractor hood over, space for both washing machine and tumble dryer, integrated fridge freezer, integrated larder unit, built in wine rack, built in dish washer metro tiles to splash areas, Upvc double glazed window to front and rear aspect. Large storage cupboard, stairs rising to second floor to Master Suite. White suite of wall mounted wash hand basin with waterfall mixer taps, low level w.c with concealed cistern, ceramic shower cubile with rain fall shower as fitted, inset down lighters, ceramic tiled floor, chrome ladder rail, extractor fan, Upvc double glazed window to front aspect. Currently fitted out as a large walk in dressing room, wall mounted electric heater, inset down lighters, access to loft space, Upvc double glazed window to front aspect. Engineered wood flooring, wall mounted electric heater, built in work desk, two velux windows. Refitted to a high specification to comprise: white bathroom suite of bath with central water fall taps, low level w.c with concealed cistern, wall mounted wash hand basin housed in family unit with drawers under, walk in width and half fully tiled shower cubicle with rainfall shower as fitted, feature wall ceramic tiling, contempory ceramic tiling to walls, under floor heating, chrome towel rail, inset down lighters, extractor fan, velux window. Open plan comprising; inset down lighters, wall mounted electric heater, Upvc double glazed window to rear aspect, door to separate w.c: white low level w.c, concealed cistern, tiled flooring with under floor heating, walk in fully tiled wet room with under floor heating, rain fall shower, built in storage cupboard with granite work top over incorporating sink with cs taps, ceramic tiling to splash areas, electric towel rail, velux window. Open plan with gravel areas edged with rail sleepers, pathway leading to property and parking space. Designed for ease of maintenance, slate paved patio with inset lighting, lawn area with astro turf, edged with sleepers, fully enclosed by panel fencing, outside tap, outside lighting. All mains connected with exception of gas. Under floor heating to all ground floor accommodation.